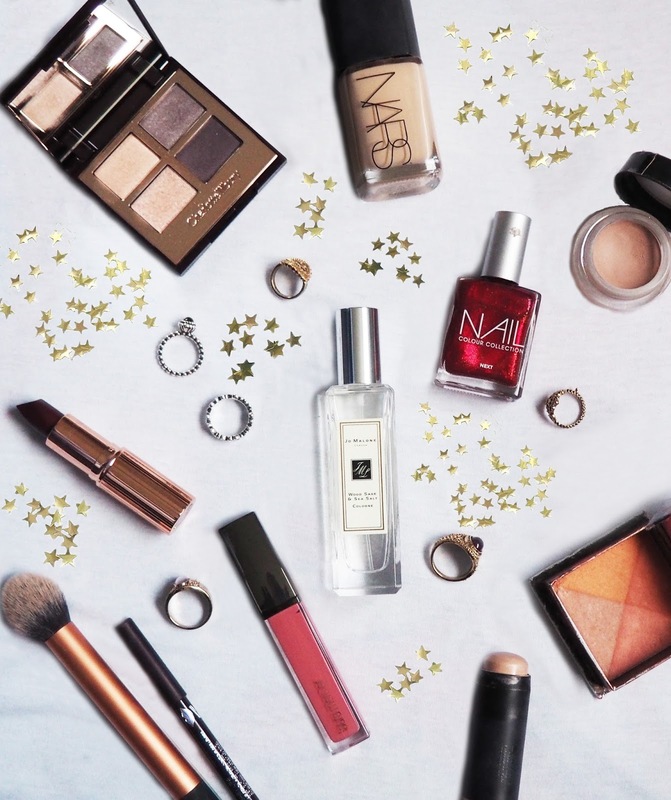 If there's ever a time to get glammed up, it's New Year's Eve. Throughout the entire Christmas period, my makeup collection has definitely taken a dip into the world of glitter, but I'm certainly not ready to let any of it go quite yet. No matter what the occasion, Nars Sheer Glow is always my go-to base for that perfect dewy finish. This has to be one of the best foundations I've come across as it lasts all day without budging, and although it's super silky when applied, it leaves a subtle, healthy glow to the skin (without looking like a light reflecting shiny mess - we've all been there). To make my cheekbones really pop in party season, I've been pretty smitten with this glow stick by - would you believe - Topshop! This gives a warm, glitzy highlight like no other. My only slight problem with this is I find it can sometimes remove the makeup underneath as it needs to be applied straight from the bullet, but it's still a perfect party piece. After applying this to my cheekbones, nose and cupid's bow, I add a little dusting of this Benefit Sugarbomb blush to the apples of my cheeks. These two products work an absolute treat together! Eyes are probably where you can go most OTT without actually looking OTT - if you get my drift. Eye makeup is without a doubt my favourite part of creating a party look. MY absolute favourite has to be this Charlotte Tilbury Uptown Girl palette, which creates the perfect smokey eye with all the glitter a girl can need added in the mix. Simple, but makes such a statement. I haven't shown them on the picture above, but I love to add some Maybelline 1000 Lashes mascara for added drama. Finally, I pop on some lipstick. I've included two pretty different colours here; one is a deep berry shade in the form of Charlotte Tilbury's Glastonberry lipstick, which is absolutely stunning and has incredible lasting power - seriously, I struggled to get it all off! Or if you want to keep the focus on the eyes, this Laura Mercier pink lip duo is perfect. I fill in the lips with the liner, then slap on the gloss for a subtle but effective lip look! Wishing you all a wonderful New Year and thanks so much to everyone who reads and comments on my posts. It really does mean the world. Let's hope 2016 is an even better year than this!